As a new feature in 2016, Mr Flavour will be doing blogs on some our favorite mixologists from around the world. With Valentine's coming up, this months choice was easy with his genius of a Valentines cocktail winning him many accolades. Bob Peters can be found behind the decadent bar at The Punch Room at the Ritz-Carlton using equipment you would expect more in a Scientific laboratory than in a bar. A master in smoke infused cocktails, Bob Peters balanced palate has come out with creations such as the Awfully Fall, Apple of My Eye, & Chai'ed & Gone to Heaven Punch. 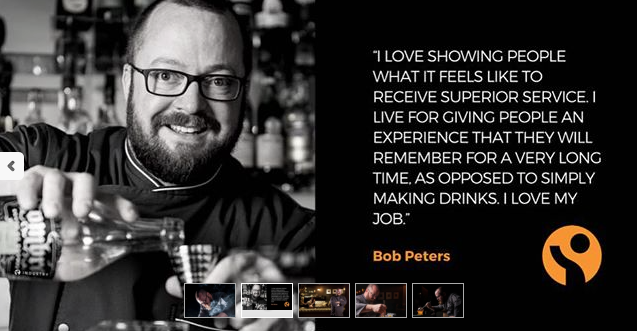 As a constant inspiration to Mr Flavour's mixologists for his passion and attention to detail, it was a pleasure to find out a bit more about Bob's passion for cocktails. This entry was posted in Press and tagged article, bars, bartender, best, Best Bartender, Best bartender in Charlotte, Best cocktail bar, Best mixologist, Best on the east coast, Blog, Bob Peters, bob the bartender, bobthebartender, Charlotte, cocktail, Cocktails, james beard, Mr Flavour, punch room, punch room ritz, the ritz, the ritz charlotte, The Ritz-Carlton.